Photo by Ming Tong, CC BY-NC-ND 2.0 India's Taj Mahal is many things. It's one of the most iconic structures on the planet and is considered among the most profound examples of Indo-Islamic art and architecture. Since 1983 it has been a UNESCO World Heritage Site and since 2007 one of the New7Wonders of the world. It is also a mausoleum. The complex is home to several structures, including a mosque and garden. What many consider the most recognizable aspect is the tomb, which is capped by a magnificent 115-foot marble dome and flanked by four minarets. The Taj Mahal was commissioned in 1632 by Shah Jahan, a Mughal emperor reigning between 1628 and 1658. 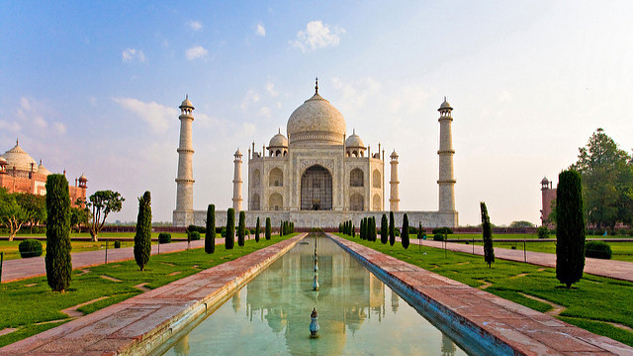 He had it built along the Yamuna River in Agra to house the remains of his wife Mumtaz Mahal. The detail inside the Taj Mahal is just as breathtaking as the exterior. It features countless decorative elements like intricate inlays with gemstones. The actual tombs of Shah Jahan and wife Mumtaz lie beneath the Taj Mahal's main chamber in a crypt. The complex is open every day except Friday from 6:00 a.m. until 7:00 p.m. and entry costs around $11 USD. Photo by Chris Hill, CC BY-NC-ND 2.0 China's former communist leader Mao Zedong is embalmed and on display in a crystal coffin within Chairman Mao Memorial Hall, or Mausoleum of Mao Zedong, in Beijing's Tiananmen Square. Mao, the founding father of the People's Republic of China, ruled as the Chairman of the Communist Party of China until he died in 1976. The mausoleum is open to the public from 8:00 a.m. until noon Tuesday to Sunday. Visiting is free and photography is prohibited. Photo by Marina & Enrique, CC BY-NC-ND 2.0 While not as well known as the Taj Mahal, Shah-i-Zinda (tomb of the living king) is equally as breathtaking. This ornate necropolis dates back to 11th through the 19th centuries and is home to more than 20 facilities, including multiple mausoleums, temples and other buildings that are adorned with intricate tile work and mosaics. Shah-i-Zinda is located in Uzbekistan in Samarkand, a UNESCO World Heritage Site. It sits on a site believed to be where Qusam ibn-Abbas, a cousin of the Prophet Mohammed, is buried. Photo by steven_n_maher, CC BY-NC-ND 2.0 In Moscow's Red Square sits the large mausoleum of former Russian communist leader Vladimir Ilyich Ulyanov. Lenin's body has been preserved and on display in the mausoleum next to the Kremlin since his death in 1924, with only a few brief exceptions. The large granite structure was designed by architect Aleksey Shchusev who is said to have borrowed architectural elements from the Tomb of Cyrus the Great and the Step Pyramid of Djoser. Lenin's mausoleum is open to the public from 10:00 a.m. until 1:00 p.m. daily, except Monday an Friday. Visiting is free and photography is prohibited. Photo by Bernd Thaller, CC BY-NC 2.0 The funerary statues known as the Terracotta Army are one of China's most impressive archeological offerings. The massive excavation site was discovered in the 1970s by local farmers and thousands of terracotta statues depicting soldiers, chariots and horses from the army of China's first emperor Qin Shi Huang have since been uncovered. The site also serves as the emperor's mausoleum and the terracotta army is believed to have been created to protect him in the afterlife. The emperor and his terracotta companions were buried around 210 BC. Given the site's antiquity and in the name of preservation, Qin Shi Huang's actual tomb has yet to be opened. You can visit the excavation site in the Lintong District of Xi'an, Shaanxi Province. Photo by David Meenagh, CC BY-NC 2.0 It's reported that Ho Chi Minh preferred not to be embalmed, but rather cremated. And yet, the former Chairman of the Communist Party of Vietnam is preserved in a mausoleum located in Ba Dinh Square in Hanoi at the site where he officially declared independence for the Democratic Republic of Vietnam in 1945. Ho Chi Minh ruled the country from 1951 until his death in 1969. The Lenin-inspired mausoleum was officially opened in 1975. Ho Chi Minh's embalmed body can be viewed in a glass coffin within the mausoleum's main hall. While the large granite building is considerably drab, the surrounding plaza is home to gardens containing more than 200 plant species. The mausoleum is open most days from 9:00 until 11:00 a.m. Conservative clothing is required and photography is prohibited. Photo by hjjanisch, CC BY-ND 2.0 London's iconic Westminster Abbey houses the remains of many monarchs and other important political figures. In fact, most kings and queens of England from the reign of Edward the Confessor through George II were interned at the abbey. The addition of other prominent people dates back to the mid-1600s with Robert Blake (since removed) and has gone on to included the likes of Charles Darwin, Charles Dickens, Rudyard Kipling and Sir Isaac Newton. Additionally, many significant people are commemorated within its walls. Among those honored, but not buried, at the abbey are Lord Byron, Sir Winston Churchill, Princess Diana, C.S. Lewis, William Shakespeare, Oscar Wilde and Henry Wadsworth Longfellow, to name a few. While it was not constructed as a mausoleum, today it serves a similar purpose. The 700-year-old Westminster Abbey is also a UNESCO World Heritage Site and is open to the public Monday through Saturday for around $25 USD. From controversial Communist leaders to a Mughal emperor and his wife, this week’s Bucket List brings you seven mausoleums you can tour. Some contain the embalmed bodies of political figures or the concealed coffins of renowned poets, writers, scientists and monarchs that are therefore famous for those they house. Other mausoleums in this gallery aren’t as noteworthy for whom they were built, but rather the structures themselves. All seven present a surreal experience.